It's been a while since we gave the grooms any sort of cake love, so today I though it would be nice to feature a grooms cake. And, since I'm in desperate need of a trip anywhere, I just had to show you this really cool groom's cake. It was featured in an article titled “Weird Grooms Cakes” but there's nothing weird about it in my opinion. 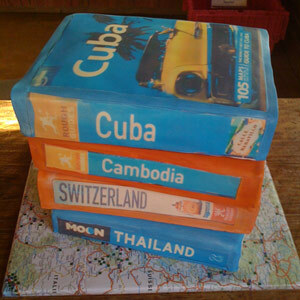 In fact, if you and your groom-to-be are avid travelers, this would be a completely awesome cake for him. The cake could feature travel guides for the honeymoon location – which would be really cool, especially if you're visiting several places on a cruise honeymoon. Or it could feature his favorite locations, or his dream destinations. Or, as was done on the actual cake featured here, the travel guides could represent places the groom has traveled. Whatever locations he chooses to feature on the cake, it is sure to be a conversation piece and something that will showcase his personality. This cake was created by Amazing Kakes and I found it here.